Forced perspective photography is a simple manipulation of the human visual perception; some call it optical illusions. It make viewers believe that certain objects are smaller or larger than they really are. It may sound tricky and complex but really all you need is creativity, a camera and an imagination. Below are some of the examples I have taken of forced perspective. Why not give it a try yourself! There are many tools out there with which to engage children but video games are a great way to immerse children into various different scenarios and develop empathy for people who are different from them or have different needs. In the UK, there are almost 2 million people living with sight loss and of these, around 360,000 are registered as blind or partially sighted. To help children understand what it means to be blind or partially sighted you could use blindfolds to give the children an idea of what it feels like to have a special need. 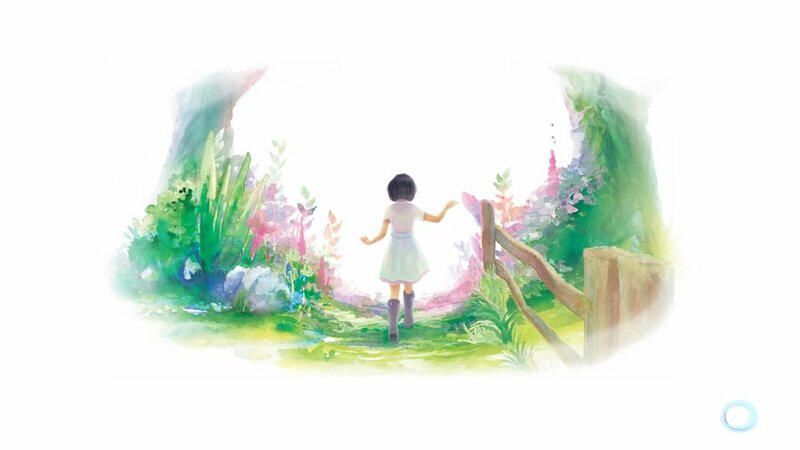 Also you could use a really interesting video game called Beyond Eyes. I played the game and was struck with how the world was painted and opened up as you moved forward. 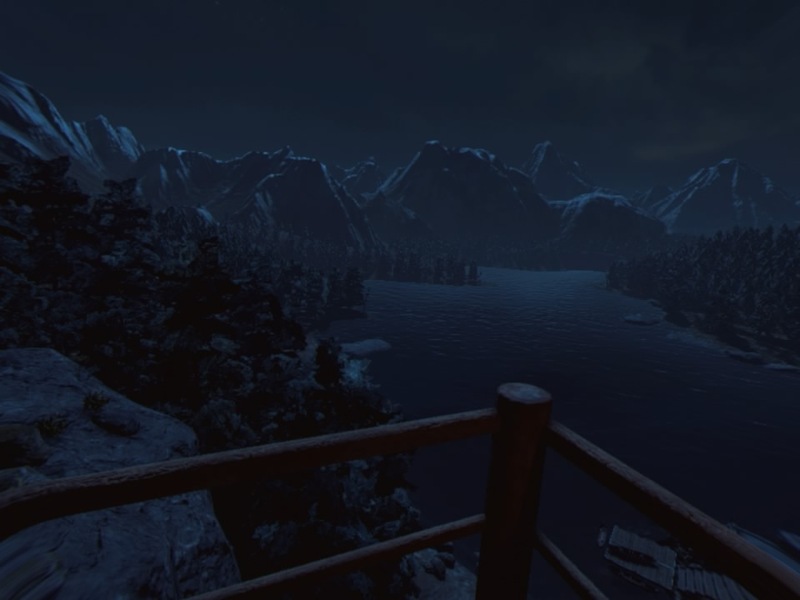 I believe that you could use the game as a stimulus to help write poetry, or a descriptive piece that focuses on the other sense as we seem to rely on sight more than any of our other senses. The video game could be used to teach empathy and give children an understanding of the difficulties people who are disabled deal with daily. It is a great as a wow PSHCE lesson or English writing piece. 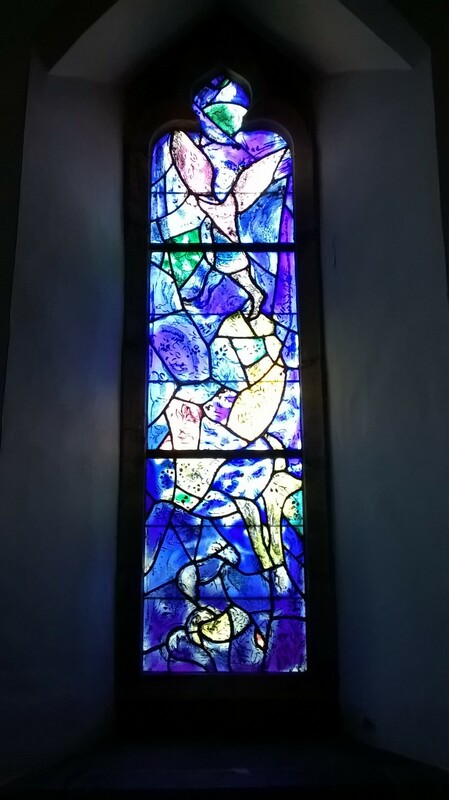 I am lucky enough to live down the road from All Saints Church, a church in Tudely, Kent which houses several stain-glassed windows by famed artistic polymath Chagall. 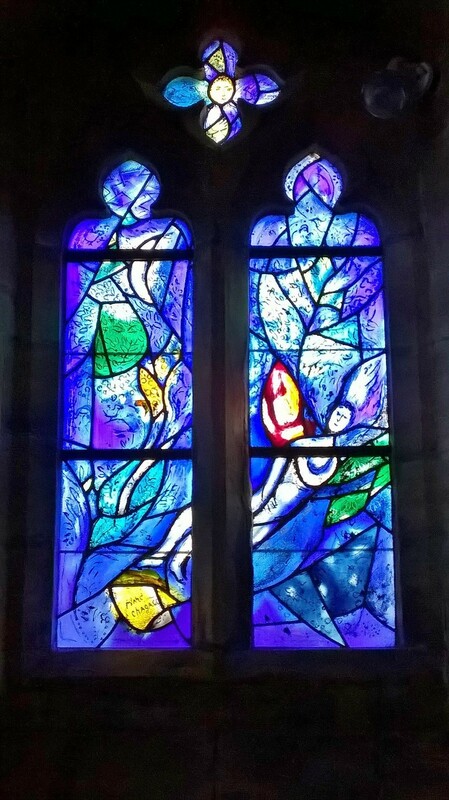 All Saints' Church in Tudely, Kent is a beautiful building which houses several stained-glass windows by famed artist Chagall. 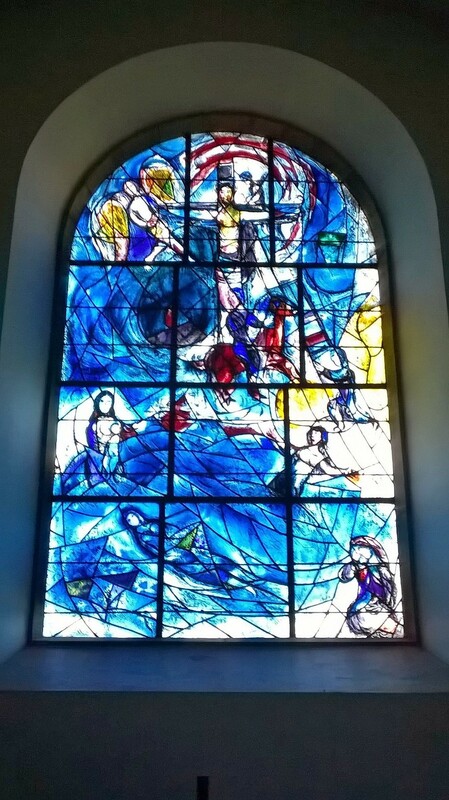 The works are beautiful and the ambience of the place is truly spiritual, even for a non-Christian like me. 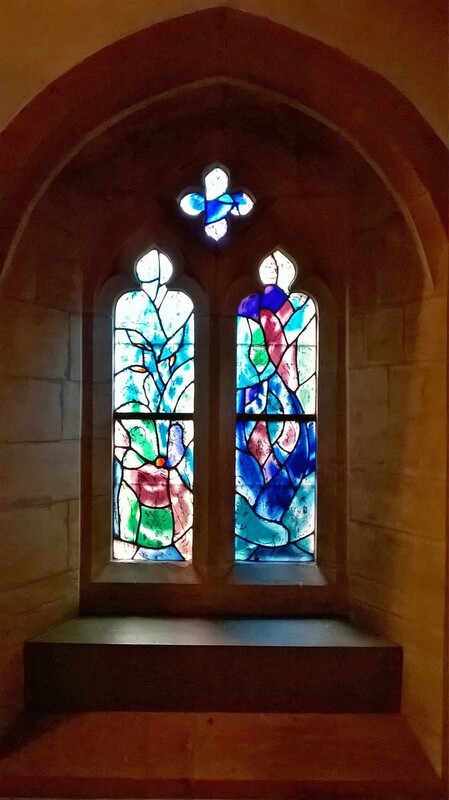 I love the ambience of the place and when it is Christmas may use it to inspired my pupils to make festive stained-glass windows. At the school I work at we have been building upon the coding knowledge to develop further skills with robotics. We bought 15 OhBots and used them to tech a progression of skills in coding and programming. For the uninitiated the Ohbot is a robot head that uses a derivative of Scratch. Priced at just over 100 pounds (about $150) it really is a good investment to teach the children coding. The OhBot allows children to generate programs quickly and encourages them to experiment and use their imagination. The OhBot is flexible in that additional sensors can be used to allow for more complex coding. We have yet to fully get to grips with it but will be sharing our work here. 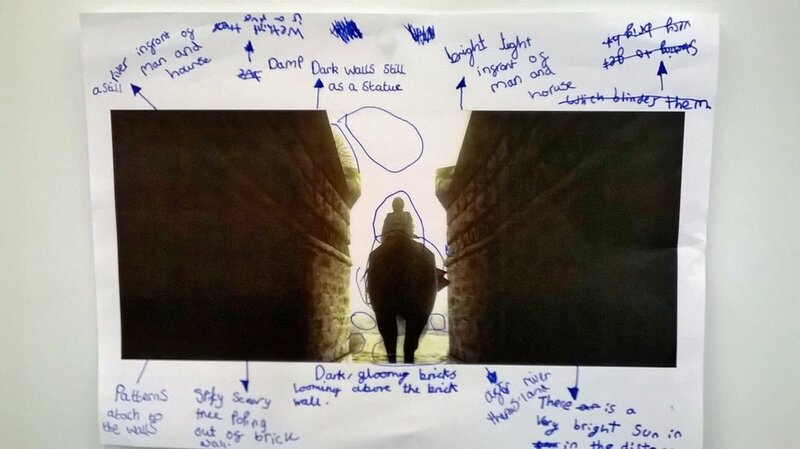 The whole thing can look pretty intimidating so have I worked very closely with a colleague to develop a year 4, 5 and 6 scheme of work which allowed the children to play and explore before getting into the more nuanced specifics of coding. To try to get the rest of the school staff enthused has been a bit of a challenge as it is time consuming and intimidating to take the hardware out of the box and programme it. So to sweeten the pill during a staff training session I gave the staff a hands-on opportunity to try the Ohbots out and the staff were immediately sold on the idea but lacked the confidence to teach a sequence of lessons on it. For the then upcoming Future Technology Week, which I was leading, I gave the staff the opportunity to book session which I would be leading. This meant that they would get CPD and I would be given a chance to deliver a lesson to many classes. The results were impressive as I taught 3 classes in year 5 and a class in year 4. Also many other classes were led by Digital Leaders, a group of pupils keen on technology and its application in classroom settings. This helped encourage the rest of the pupils as they were guided and mentored by their peers and as a result the whole process was less intimidating. Makey Makey is an impressive but easy to use development kit that turns everyday objects into touch pads and combine them with the internet, online resources and games to open up a world of possibilities. 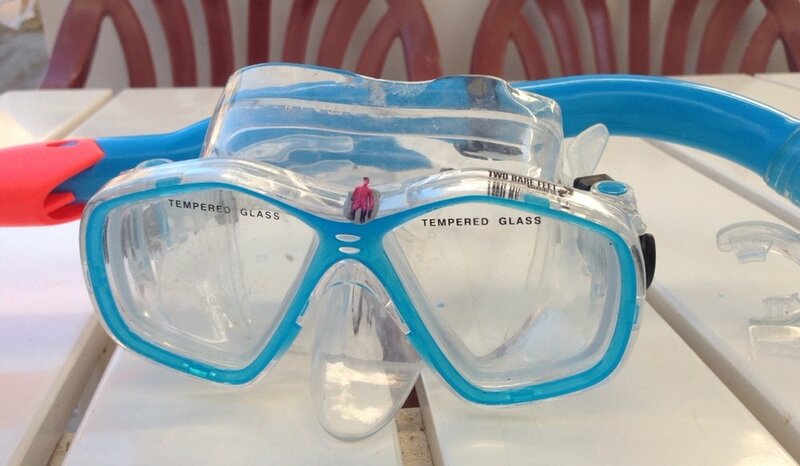 It's a simple invention kit that can be used by people of all abilities and for all manner of crazy reasons. Fancy playing a game using playdough as a controller? Go for it! How about a banana piano? No problem! As part of our Future Technology week at my school pupils from reception to year 3 were given the opportunity to use the Makey Makey kits to create their own controllers to play a Pacman game. Below are some of the designs the children made. As well as making controllers the children also had the opportunity to make banana pianos. They loved the chance plug in all the wires and explore what would happen with the different apps available. Some pupils played Canabalt, the endless runner game and enjoyed challenging each other whilst others were happy to bash away at the bongos. As a piece of equipment to inspire and bring a sense of awe and wonder Makey Makey is pretty had to beat and hopefully next year it will be embedded into our Science scheme of work. 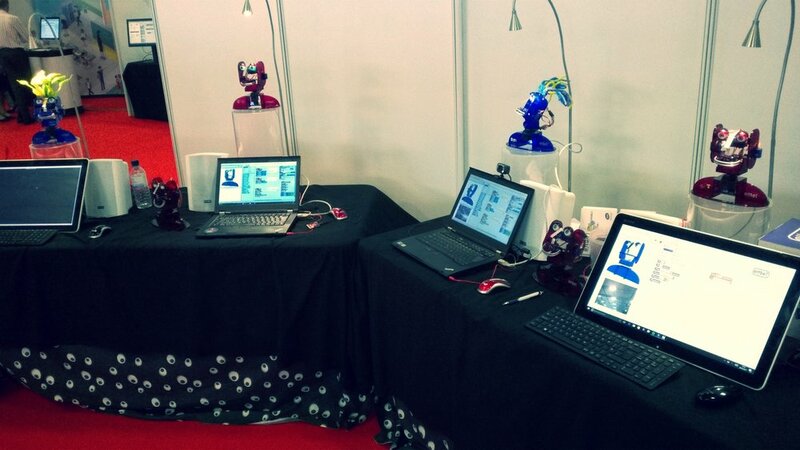 Several months ago we purchased some mBots, programmable robots which can be controlled using a derivative of Scratch. The robots are adaptable and can be made to follow a lot of different algorithms and with the purchase of add-ons are adaptable for higher level coding and exploration. At under £80 per mBot these are quite an inexpensive way to get into coding. 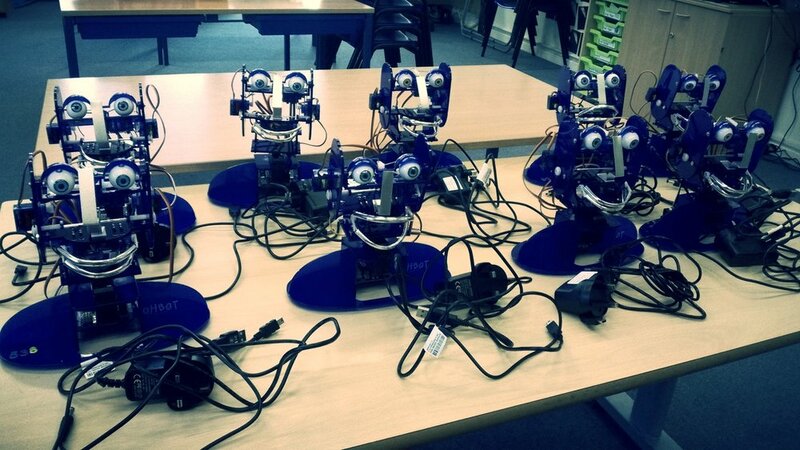 We decided to purchase 15 to allow our pupils to share one between them to move on from Beebots and Roamers. As part of the Future Technology Week I was organising at school I had to plan for year 2, 3 and 4 children to use mBots to code and explore. For the year 2's we used the app mblock on our ipads to allow them to use the intuitive drag and drop interface. For the year 3's and and 4's we used the the same software but get them to look at more complex aspects of coding including algorithm design, command sequences and control flow, conditionals, loops and using the sensors to solve problems. At my side I had Digital Leaders, children with a keen interest in computing and they supported the teachers in the various classes over the week. The sense of excitement in the class was palpable and the results achieved were excellent. We have now got the teachers keen to try this and have embedded it into our progression document for Computing, so it will be integrated into our yearly practice. The possibilities are truly endless for what can be achieved with this impressive little robot and I hope to share more good pratice here! 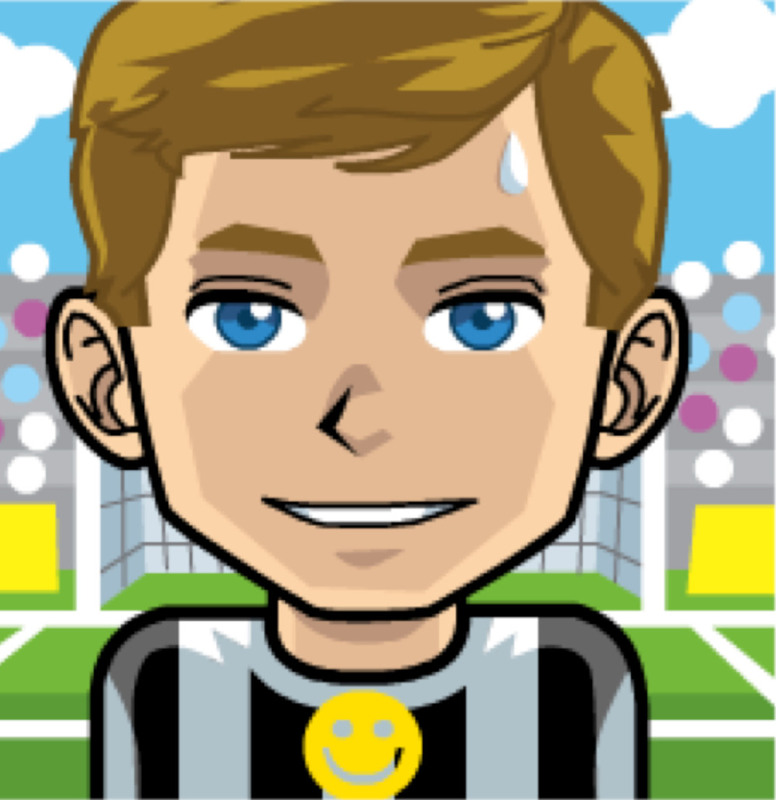 Immersing the pupils is important if you want to get the best out of your pupils, often we use books and images to engage pupils but how about videos games? 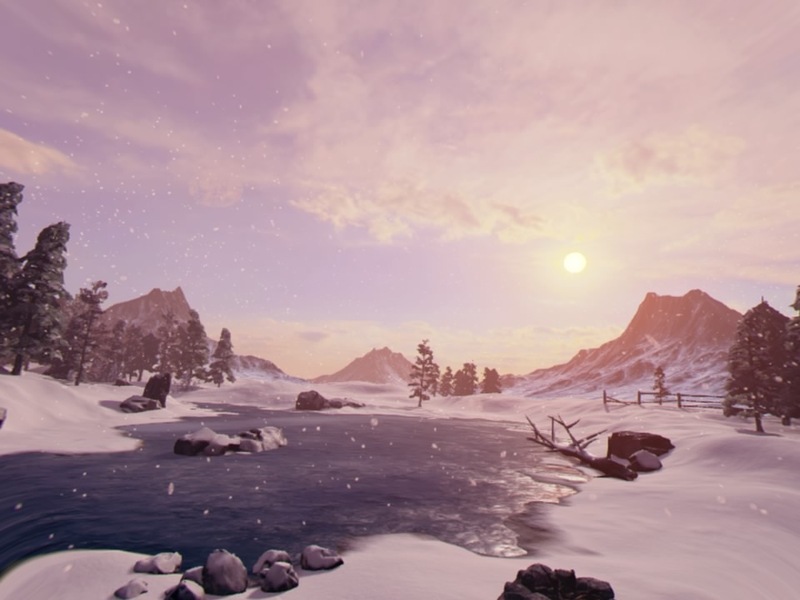 I've written a few articles before about how you can use video games to create a whole sequence of work and use parts of games as a contextual hub for learning but how about using small video game montages of a theme to create descriptive writing. 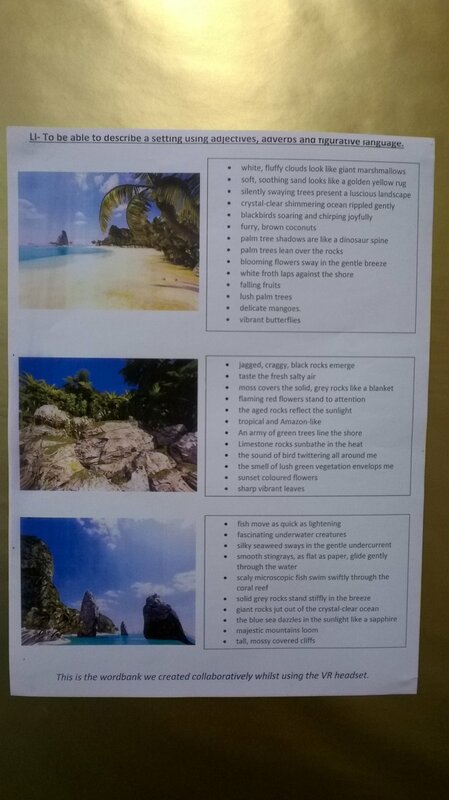 I have been using the wonderful videos of 'Other Places' to get children to write descriptions of a wide variety of settings and the results have been brilliant. Here are some of the links I have used and I would recommend them as they are free to use and adds a bit of wow to lessons! 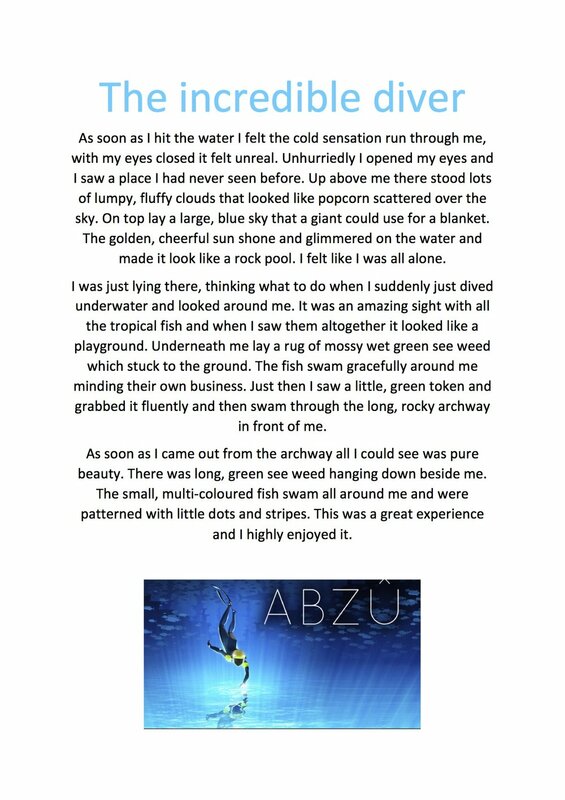 At our school we have been using the game Abzu as a stimulus for writing. 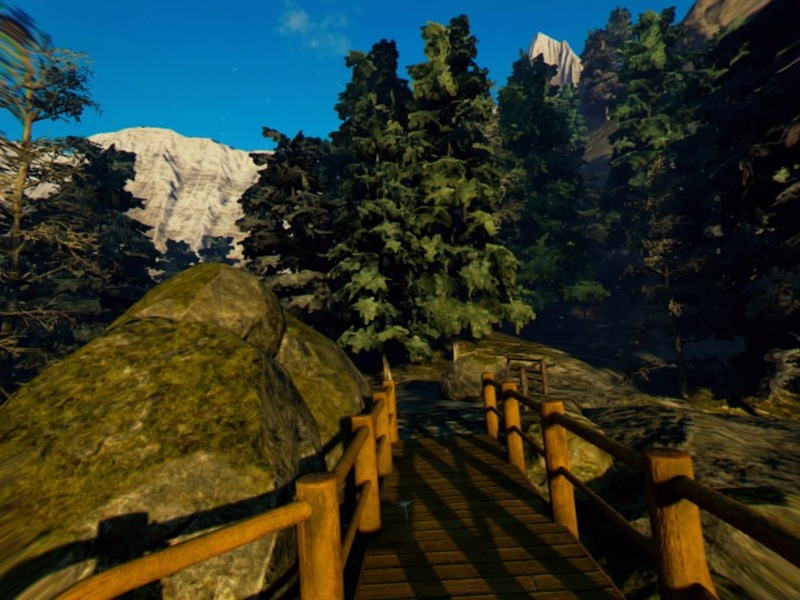 I've spoken before on numerous occasions about how video games can be used as a contextual hub for learning and in the past we have used some games to help on the learning journey. I have played and completed Abzu in my own time and I enjoyed the experience, the fact that the story line and its meaning were ambiguous, its visual style abstract and its music soothing and dramatic made me feel that this would be a good game with which to engage the pupils. At its core Abzu is a diving game but this is incredibly reductive as in the game most of the time is spentswimming with the myriad of underwater creatures, but it's distinctive visual style of flatter shapes, flowing lines and an expressive use of light and colour make it stand apart from the more uniform style of games like Endless Ocean, another diving game which I have used previously. In Abzu you play a silent diver and explore a strange, underwater realm. In terms of gameplay, it's fairly simple as you swim and interact with a few mysterious objects. 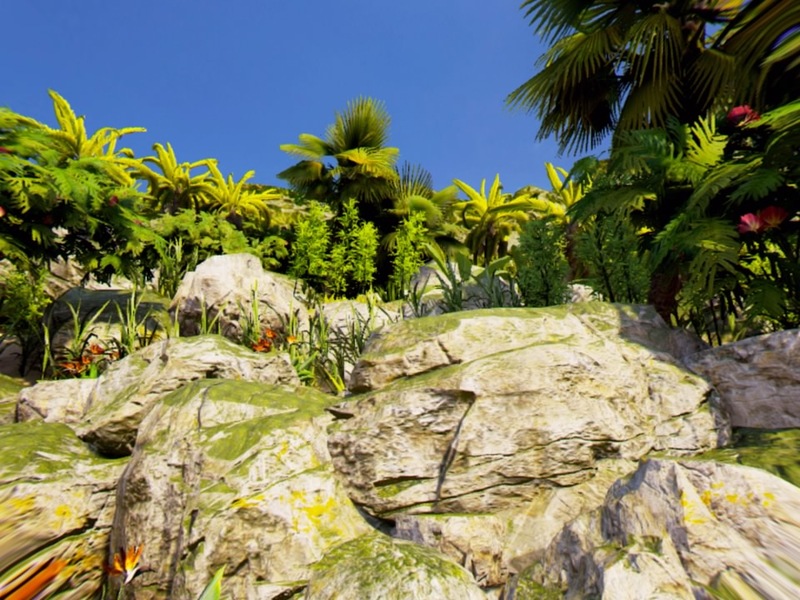 Because the game itself has minimal HUD on screen all you see are the gorgeous visuals with the natural environments in lush bright colours giving way to mysterious sunken ruins with strange hieroglyphs, which seem readable but for the need of a Rosetta stone equivalent. But there are no question marks about Abzu's beauty. It's not so much that the individual elements are all that astonishing, but the way they're orchestrated, with the shoals of beautifully animated fish, the slowly undulating vegetation, the areas of coloured light and shadow, regularly takes your breath away. At its best the union of music and visuals can be absolutely magical. 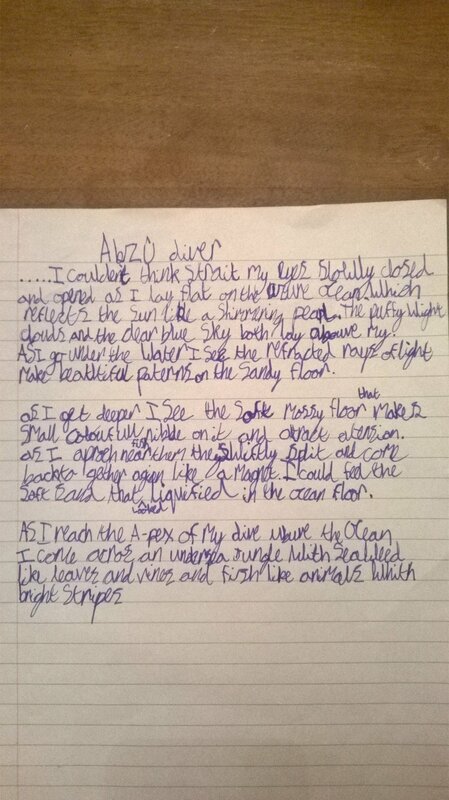 In our lesson we used Abzu to write a descriptive piece of writing. 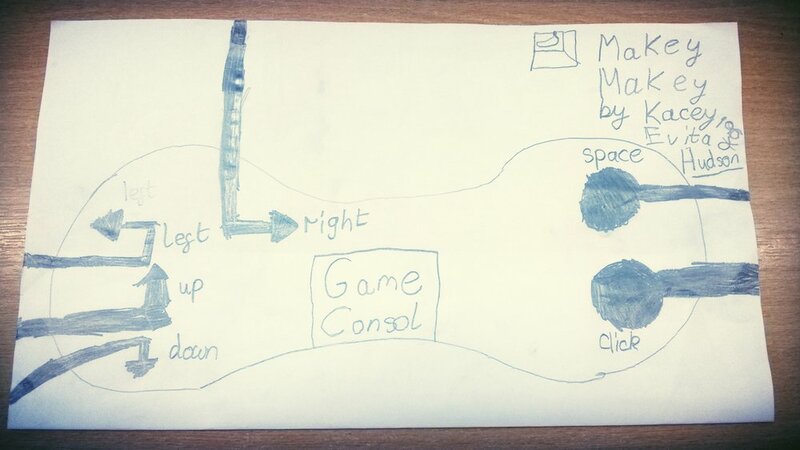 The children were presented with an image of the cover and had to predict what the game was about. Then we started the game where the diver is seen to be floating on top of the ocean, motionless and with its eyes closed. With the click of a button the eyes opened and the children gasped in delight as I ascended to the top of the sea, all around there was ocean and glimmers of seaweed in the distance. Having played just the first 15 minutes of the game the children were entranced and engaged. 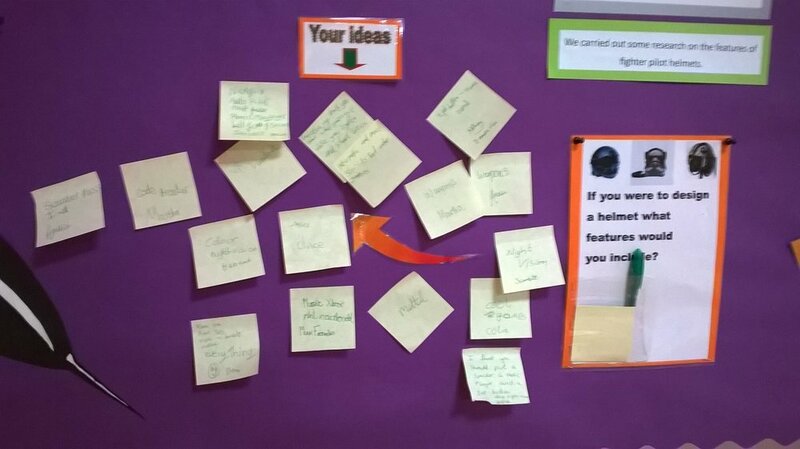 They produced wonderful wordbanks of phrases and ideas which they shared made improvements upon. 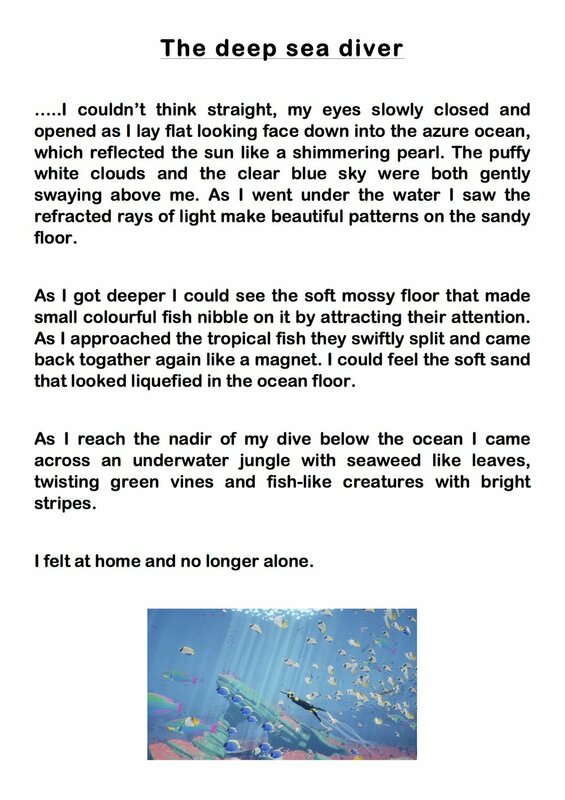 After I showed the children the scuba diver poetry scene from Bridge to Terabithia and we discussed why this short poem was so effective in conveying the emotion of what it is like to be underwater. The children were inspired and then spent the next 30 minutes working in pairs writing and refining their descriptive sentences on their whiteboards and transferring into their paper. 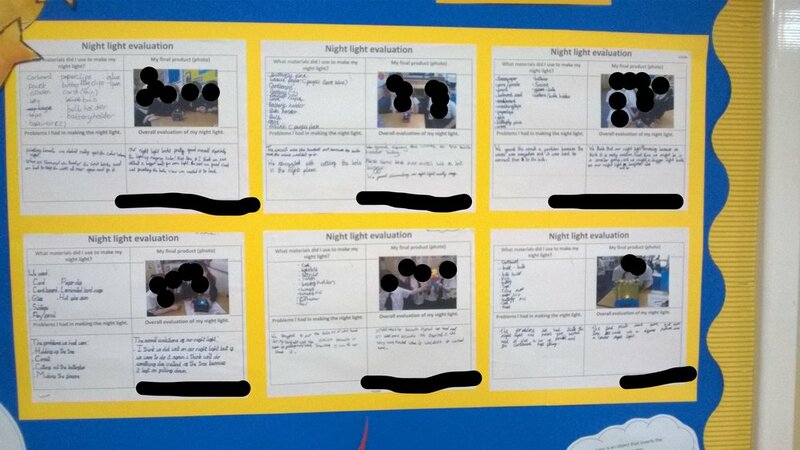 The children shared what they had done and constructive feedback was provided by their peers. 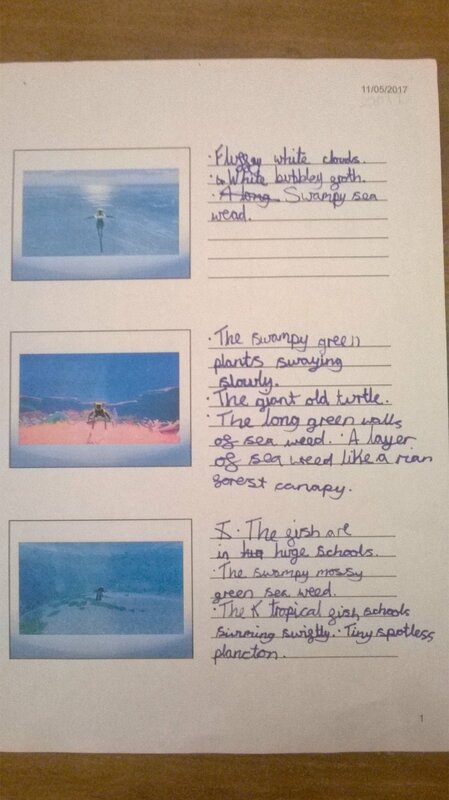 For a short sequence of lessons this was a great way to engage the children but I know that this could be part of a much longer teaching sequence and next year I hope to plan it in for our underwater themed topic using the plans I used with the book Dougal's Deep Sea Diary and the old Wii game Endless Ocean but updating it for this current generation software. The Electricity unit for Science is always exciting for the pupils but when it came to making a product to show their understanding of circuits and conductors and insulators we decided to make nightlights. The project was part of a sequence of Science lessons and the nightlights themselves took a whole morning, the complexities arose when trying to ensure that the circuit was working and wouldn't come loose once fixed into place, however as you can see below the results have been marvellous! For the link to the lesson plans and resources click on the link below and it will take you to TES where you can download it for free. 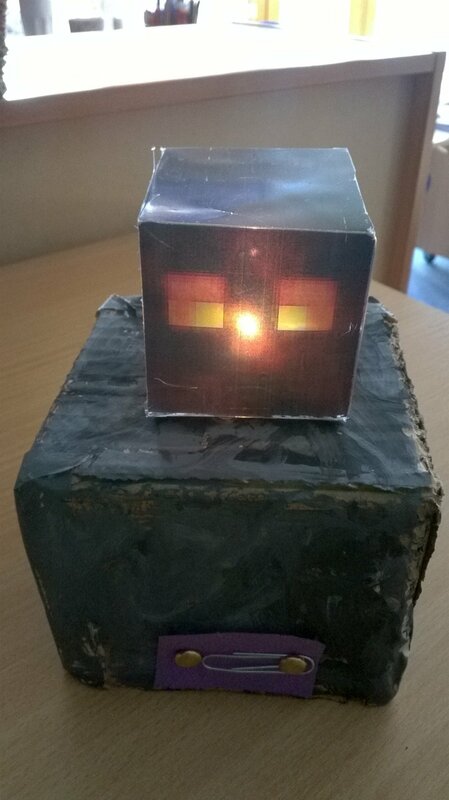 The nightlights were used in the school corridor for all to see and the step by step process of their creation was shown. 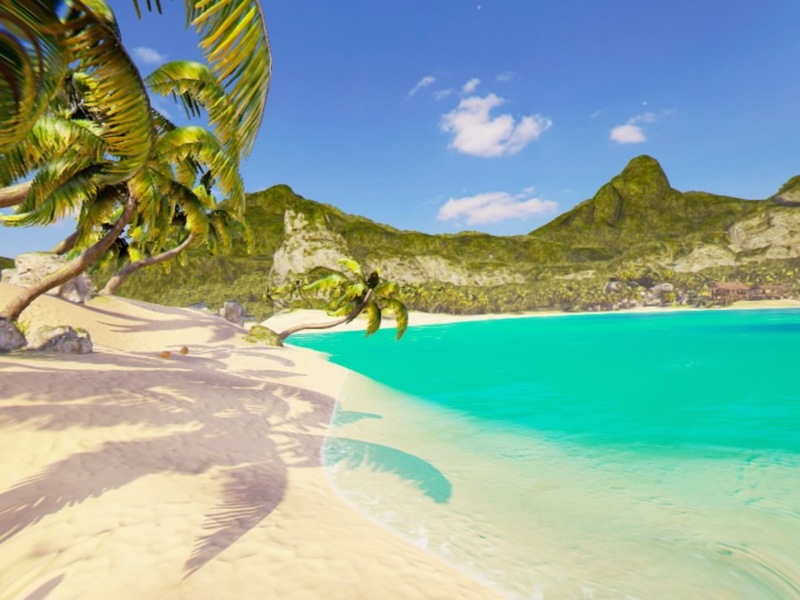 Video games have the ability to engage pupils like no other medium and that is why I was delighted when as part of our work on Kensuke's Kingdom, the adventure novel by Michael Morpurgo, I was able to persuade my colleagues to use the PlayStation VR to use the game Perfect to immerse them in detailed rendered representation of a tropical beach. We used the PSVR and connected it onto a projector and sound system. I was controlling the VR headset as it is not recommended for anyone under the age of 12. I held the VR headset in my hand and controlled it in this way so I could still speak to the pupils. I recorded the gameplay using the recording option and uploaded it onto YouTube.com so the children could refer to it whilst they were writing their piece. 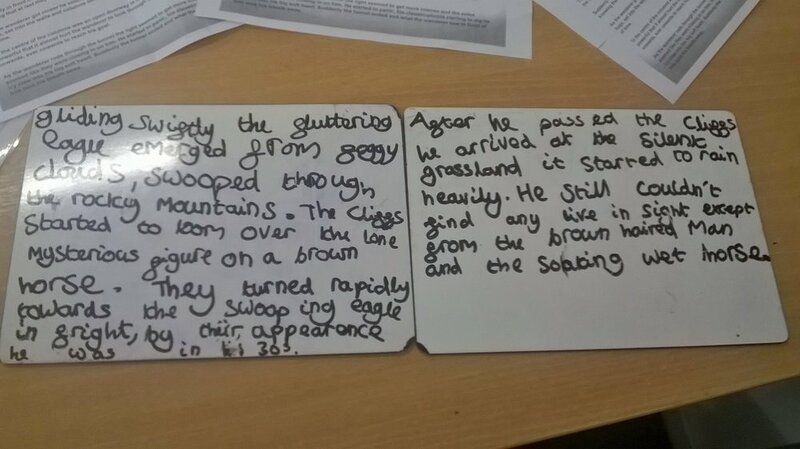 The children all had whiteboards and pens and wrote adjectives, adverbs, prepositions and figurative language on their boards and then they wrote their first paragraph in their books using the notes they had made. 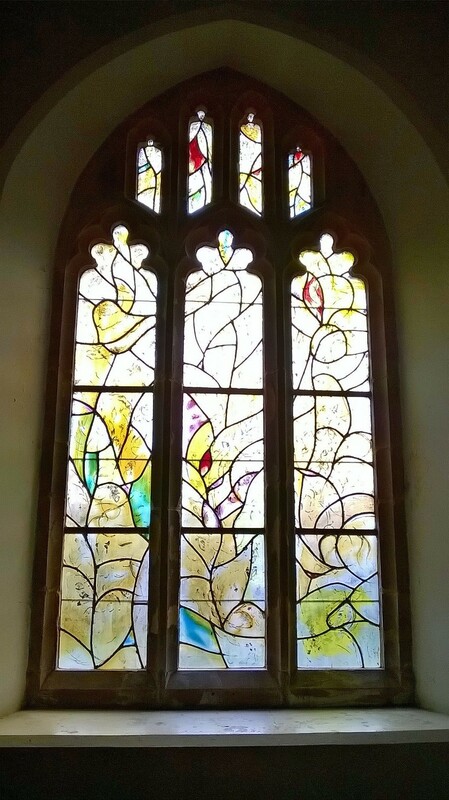 The sequence of work is still continuing but currently this is what we have produced. 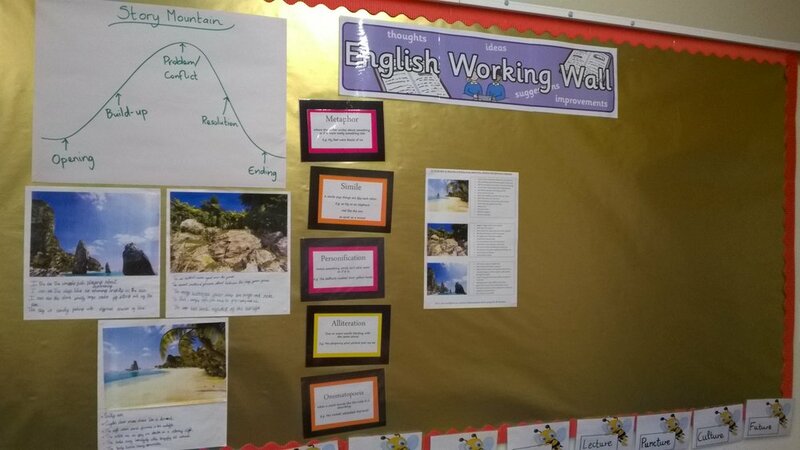 I have included our working wall as this will be added to over the coming week. As an interactive medium, video games can be an amazing teaching tool off which to hang learning. They have the ability to engage pupils in a way that other mediums like books and films can't as the games can simulate and adapt to the decisions of the individuals, if we want to go left we can go left! However being an enthusiastic early adopter of technology and being able to convince other teachers of its application is another thing altogether. So I was delighted when as part of our unit of work on Kensuke's Kingdom, the adventure novel by Michael Morpurgo, I was able to persuade my colleagues to use the PlayStation VR we had purchased at school to help us engage and immerse our pupils. We thought that the most appropriate use of the technology would be to describe the setting when the protagonist, a young boy called Michael, wakes up on the shore of a beach after falling overboard his family's yacht after a storm. 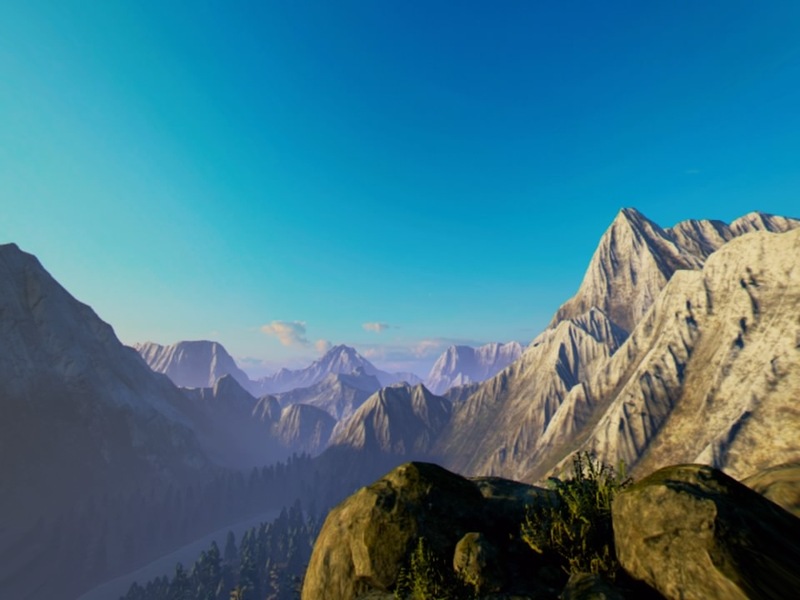 We purchased Perfect for the Playstation VR, which aims to immerse you in detailed rendered worlds. 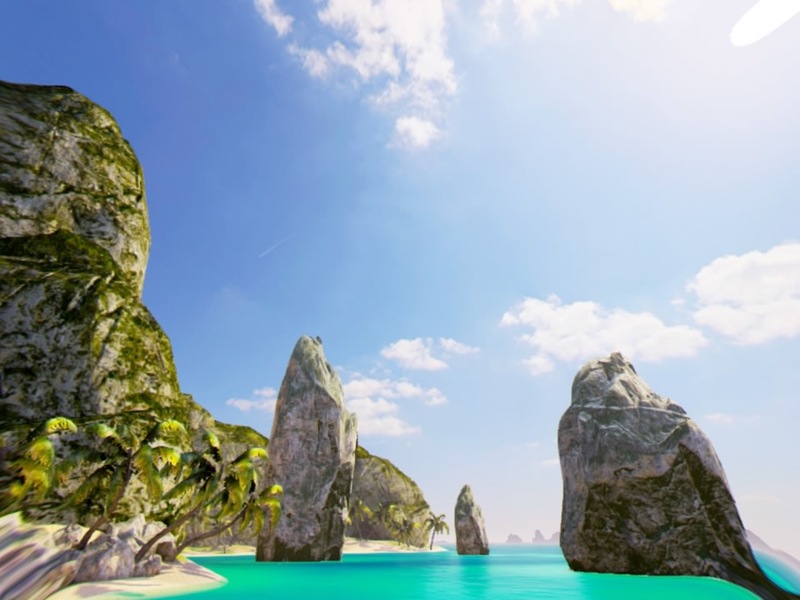 It is described as a transportative, meditative experience which mentally teleports you somewhere different; be it a mountain cabin, a tropical beach or a tundra landscape. 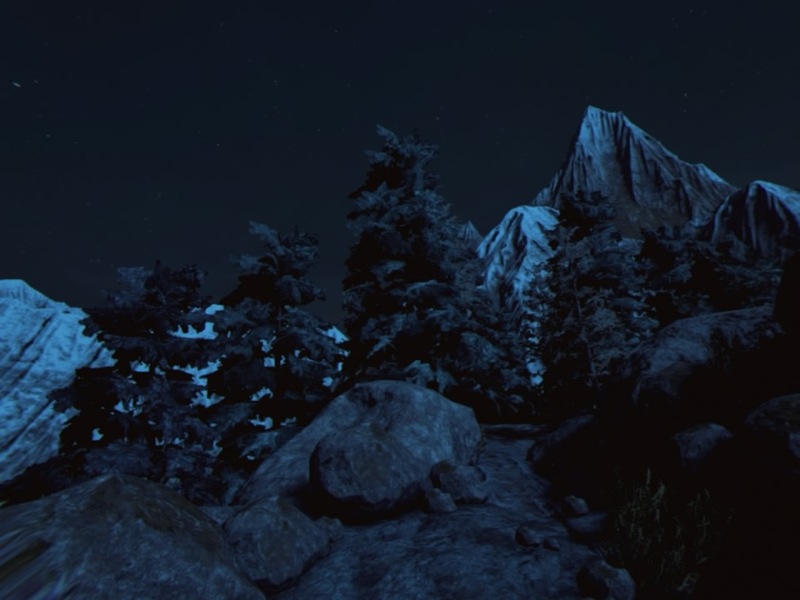 The three different maps each have a day and night variation and the scenes are pretty detailed and immersive but there are some shortcomings. For all the locations you only have 3 views from which to stand and see the views, this is not a walking simulator but more like a 360 degree digital wallpaper. As a gamer this is a huge problem but as an educator this is not so much of a problem as Perfect provides more than enough material to stimulate the pupils. We will be using Perfect later this week and I will share the work produced here. In the meantime, check out the videos and images I've recorded below as they could be used as a stimulus for writing for your class if you don't have access to the PlayStation or PSVR. 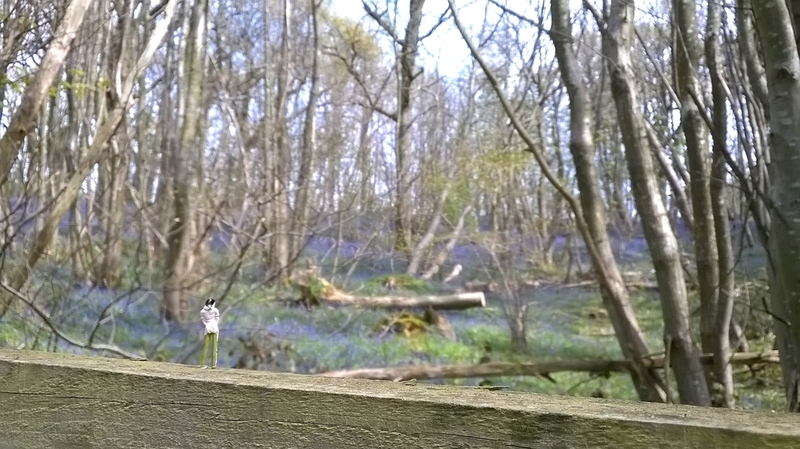 I have created videos of all the settings with no commentary and these can be used to engage the pupils but there is nothing like wearing the VR headset and feeling like being 'there'. For the use of a whole class I would recommend connecting the VR headset to the interactive whiteboard and recording the session using the PlayStation 'SHARE' button, which is how these videos were made. As a teacher and an avid gamer I like to have my children be excited and in awe of what I teach. There are many tools out there but video games are a great way to immerse children. 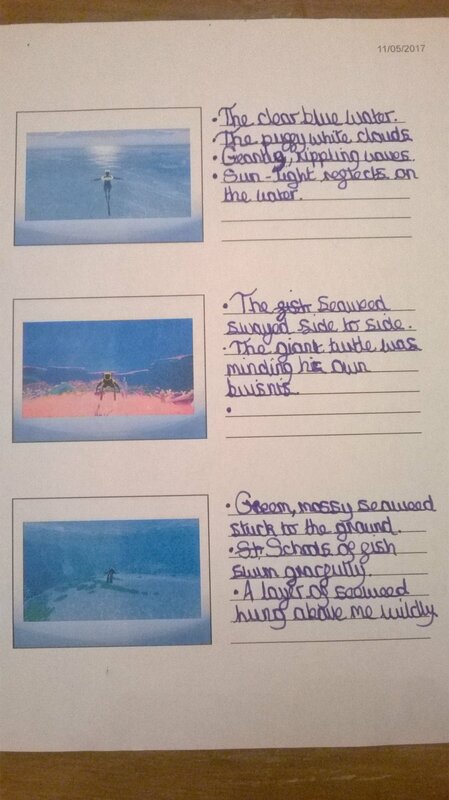 So in this spirit I used one of my favourite games, Shadow of the Colossus, which has an exciting and intriguing introduction as a story writing stimulus I planned a sequence of lessons with the intention of getting the children to develop their vocabulary, specifically their use of adjectives. The lessons took place over the course of a week and a half. To get us into the right frame of mind we listened to the ambient soundtrack, watched my play-through of the first few minutes of the game (using careful editing I avoided any inappropriate material) and wrote the story in draft and then types and illustrated it. I converted the finished file into a pdf. and will be placing them onto our school website so that parents could put it on their Kindle, ipads, iphones etc. Here are samples of some of the work we have produced. Shadow of the Colossus is a great tool to develop higher level vocabulary. The children then planned introduction on whiteboards first. 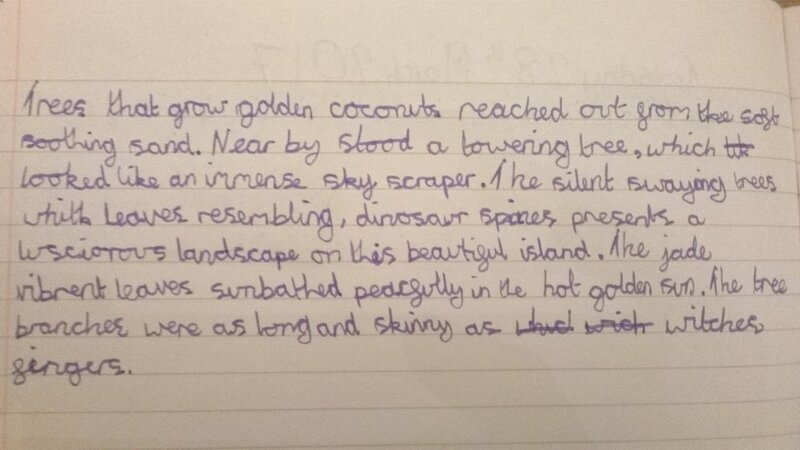 This is an example of the introduction written by one of my pupils. BAE Fighter Pilot Helmet Competition... And We're In The Final! Edit: We won the competition! 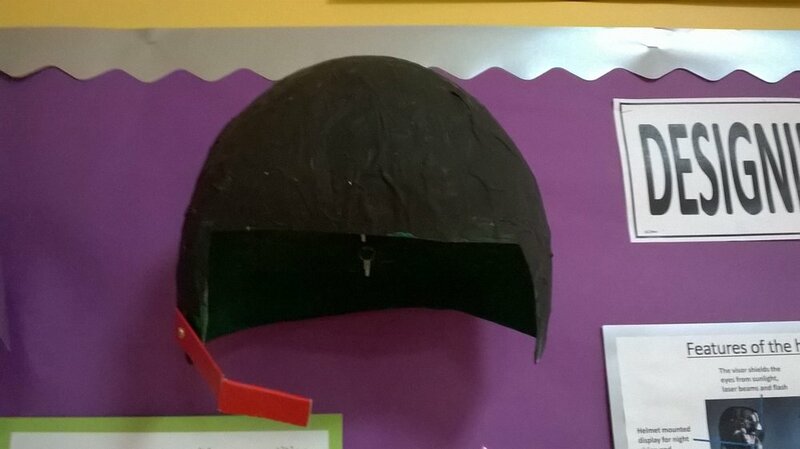 British Aerospace organised a nationwide competition inviting children to take part in their Design and Technology challenge to create a fighter pilot helmet of the future. The project would require teams, up to a maximum of 4, to produce a fighter pilot helmet of the future which could handle the practicalities of day-to-day use as well as consider technological advancements that might provide the wearer with an edge over their competitors. The deadline for the project was 27th October but our school broke up the week before for half-term so we had a tight deadline of just 3 weeks to get everything done. 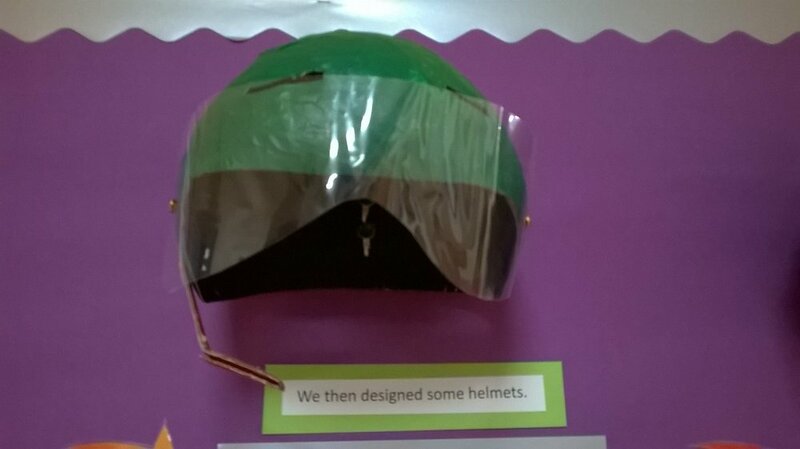 Over the course of the weeks we used the lunchtimes to research, plan and create our helmets. We had 3 teams and they were in competition with each other as only the finest presentation and ideas would be chosen to take part in the final where other schools across the country would take part in a live final. Luckily one of our teams was chosen and so on the 30th November they will represent our school and present their work to a panel of judges where they will be asked questions and their work will be scrutinised. The most difficult aspect of the whole process was the cutting out the circular shape for the magnifying glass as the shoe boxes were quite thick. However it was worth the effort as the results were excellent. It required a bit of tweaking to get the image clear but overall the result was well worth the 45 or so minutes it took to create a final piece. I'd recommend you use a very strong magnifying glass as this will dictate the quality of the image. If you have a spare hour or so why not try it yourself? 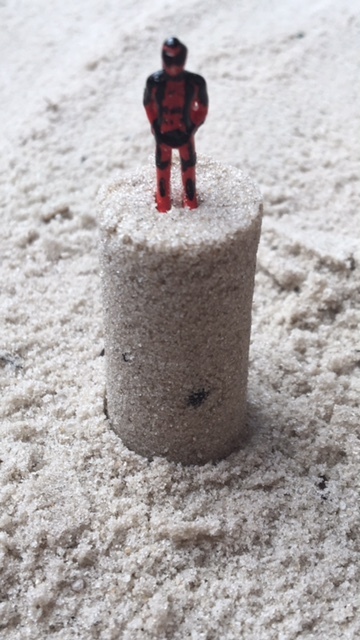 So I mentioned before how I organised a competition for the children in my school to take a miniature figure on their holidays and compose a creative photograph. 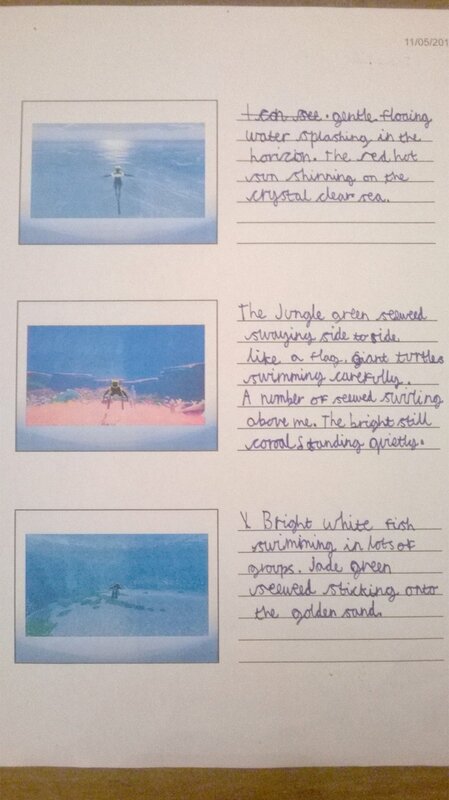 I was interested in seeing the types of images created by the pupils and the teachers. Well, the entries are in and they are suitably awesome. Have a look and see what you think! 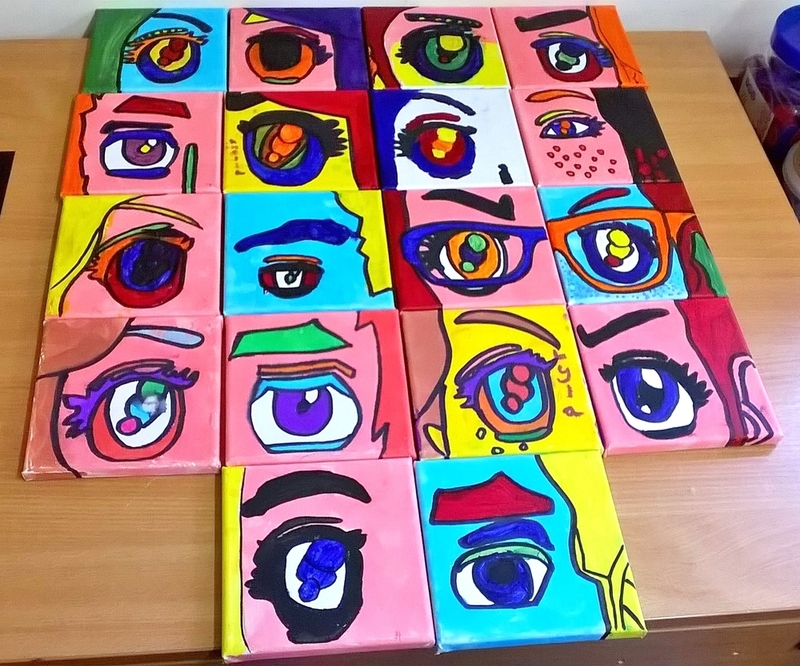 The summer holidays are a time to relax and spend time with family and friends, however 6 weeks is a long time for some so at my school I created a fun project for the children and teachers to take part in. 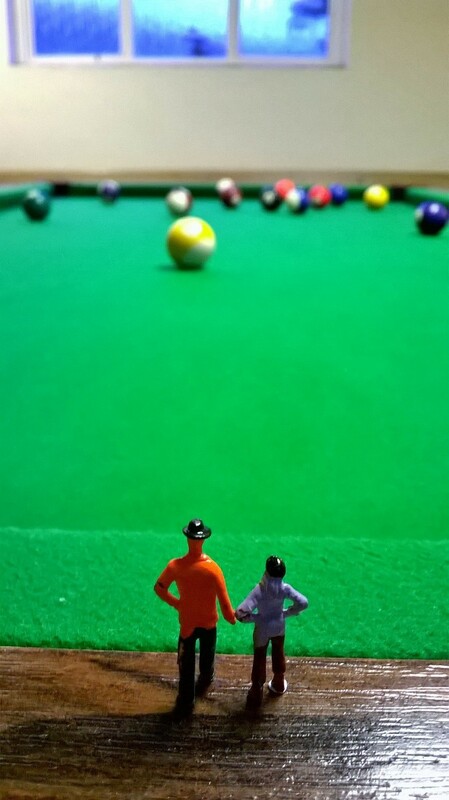 The idea is to place miniature figurines in a the real world. 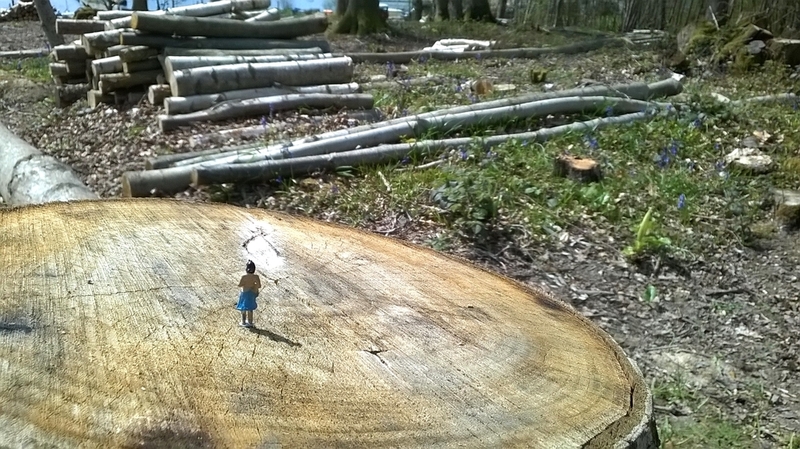 This project requires a special type of photography where playful scenes are created with the use of tiny people. It requires an interesting use of skills including forced perspective photography, setting up of the scenes and even miniature figure painting. Here are a few of the images I created to show to my school to get them inspired. 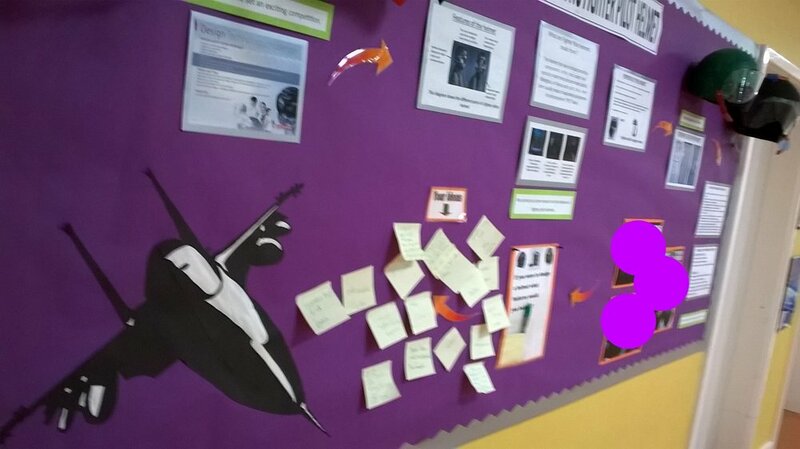 Now that we are back from the holidays the pupils are bringing in their compositions and I look forward to seeing their entries. I will be sharing a few of their best entries when the competition ends next week. I've spoken before about Virtual Reality, about how it was set to be the next 'big' thing, the next piece of must have technology... but much like 3D TV it's moment never came, until now maybe (for VR not 3D TV, no-ones interested in that!). The iPod changed the way we consume music. YouTube has changed the way we distribute content. Steam, an online video game purchasing platform, has changed the way millions of gamers play their video game. We must prepare the children for the changing face of the world by preparing them for things that haven’t even been thought of yet. I feel strongly that VR could change the education system. As teachers and educators we like to immerse our children in topics to interest and excite them. With certain topics this is easy as we have to facilities and resources nearby to engage them, however with certain topics like history this can be difficult as the places we are discussing are often not within reach. How much more thrilling would it be to stand in the place we are learning about? We can't take our classes on an educational visit to Egypt for example when we are learning about the Pharaohs but what if we could take them there virtually. Well, with the power of VR we can. 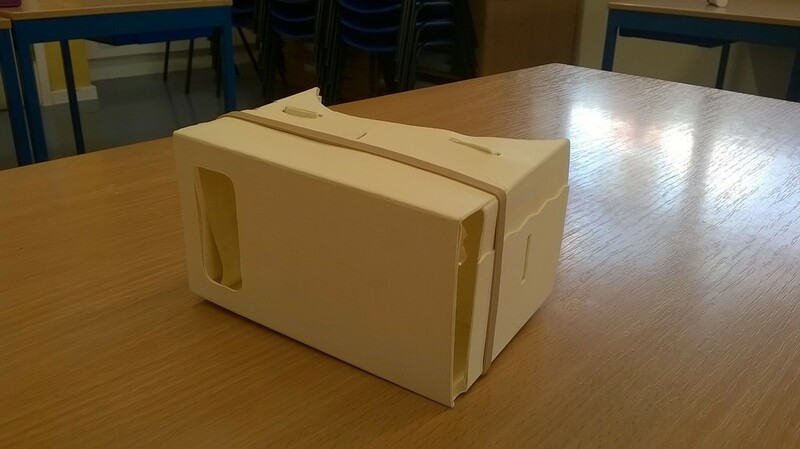 In this spirit of embracing the future (and past) the pupils in my school made their own Google Card VR headsets. It may not look like much, a simple unassuming little cardboard box but through the use of magnetometers, accelerometers, gyroscopes and external head cameras, which come as standard in most mobile phones, we have the opportunity to transport our children to amazing places. We made the kits ourselves by using the Brother ScanNCut machine to cut out the Google Cardboard template, and lenses I bought on amazon.co.uk for 80p a pair and a large pack of magnets which cost just 30p each. The whole cost was less than £1.50 but for this low price the children had a complete VR headset! 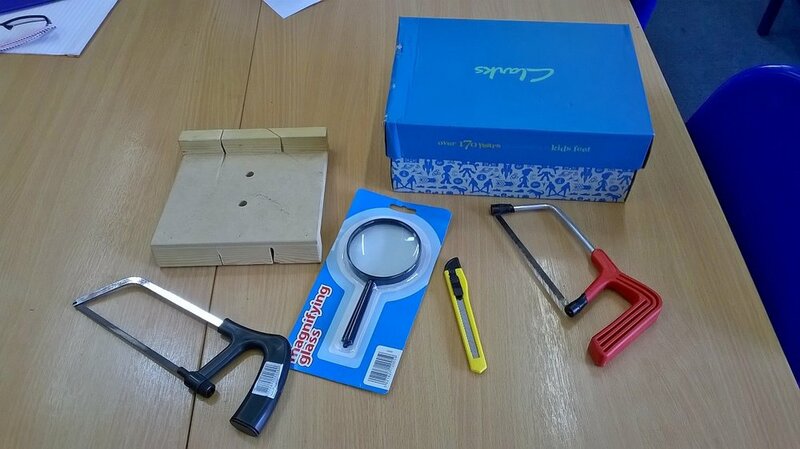 For those not used to crafting their own kit for about £10 you can buy cardboard housing for a smartphone running Google's Android mobile OS, a lens kit, some magnets, some velcro and a rubber band and an easily programmable Near-Field Communication sticker tag for launching the companion mobile app. The children loved making their headsets and took it into their classes to show their peers, there was a great buzz as pupils had a chance to immerse themselves in a roller coaster ride. Teachers were excited about the prospect of VR and what implications it could have for their practice. As with any new technology there needs to be discussion about its implications upon the world. In Japan, there are hundreds of thousands of young men who do not engage in society but rather seclude themselves at home, living through the virtual world. This is such a phenomenon that they even have a name for it, hakikomori. With the emergence of VR there is a real fear that people may become plugged in but may not plug out. We need to ensure we talk to our children about being plugged in all the time- it is a real danger. I hope to create a class set of VR headsets and with the use of iPod touches download many useful apps which could be used across the curriculum. As usual any work done will be shared here but I am excited by what the future could hold with VR in the classroom. 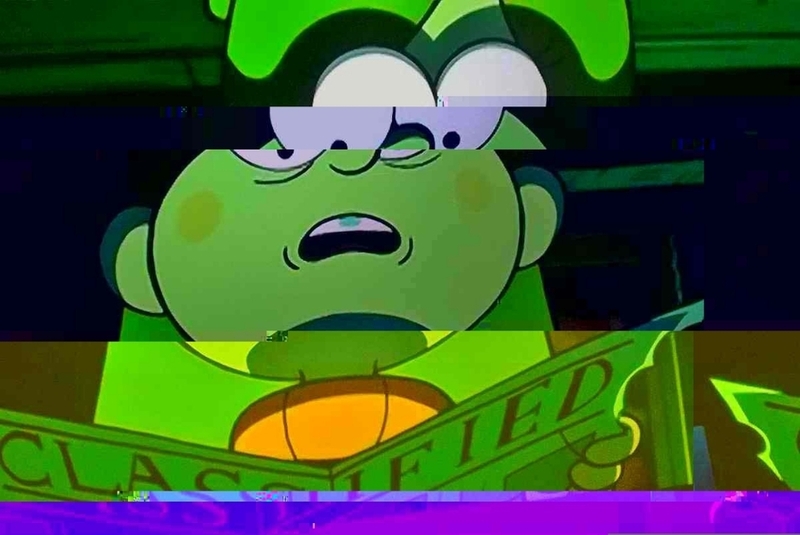 Glitchy media appeals to so many people as it is so unpredictable, in a world of mundane and clean visuals it tickles the nostalgia bone or looks aesthetically pleasing to have something unexpected occur in a visual medium. We live in an electronic age where things are locked and so when they break they are broken for good, often repairs are prohibitively priced. However old technology is different, when things are 'broken' it's not really broken... just jankily working! 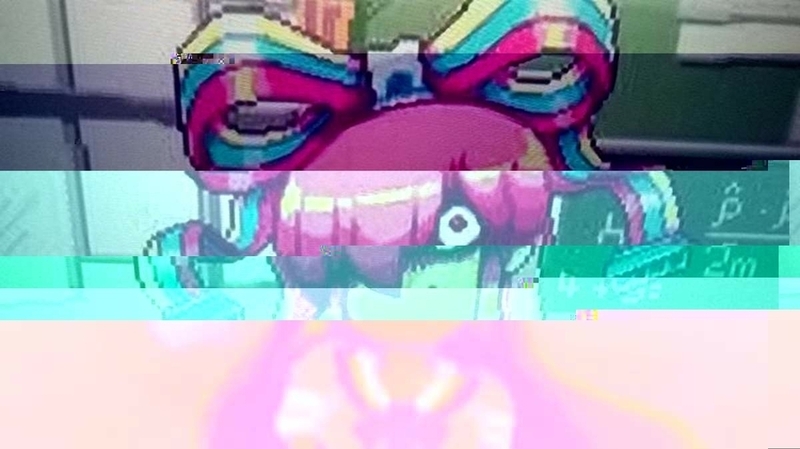 Lovingly used old VHS tapes develop scan lines or tracking problems and CD's skip and stutter after being scratched, they work but in unpredictable ways and this is what makes Glitch Art so interesting. The human and broken electronic medium work well to create something new from something 'broken' and it's not just a human imposing its will, the electronic medium contributes something to the process in its unpredictability. Even though there is a desired result the outcome is always a pleasant surprise as it is unknown and unknowable. 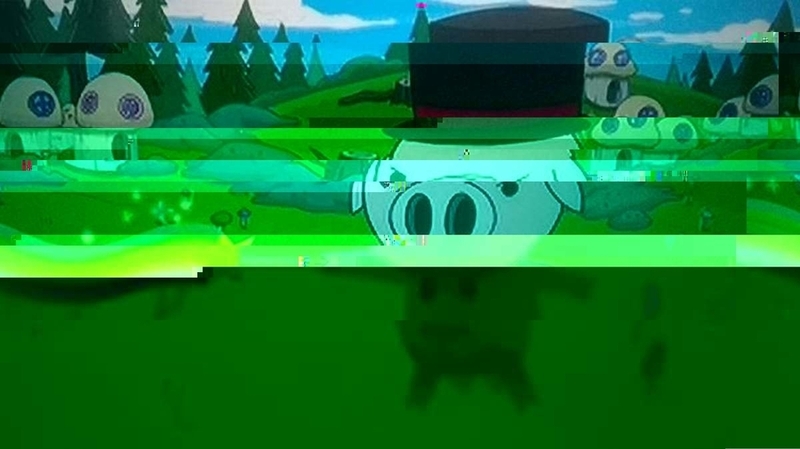 I'm not sure as to why there has been an explosion in Glitch Art but it might have something to do with the fact that we live in a time where we can capture moments in precise detail using HD video, cameras, audio recording equipment and so on. To break from this idea of perfection and beauty artists are harnessing the broken to show that beauty can be seen in the broken. 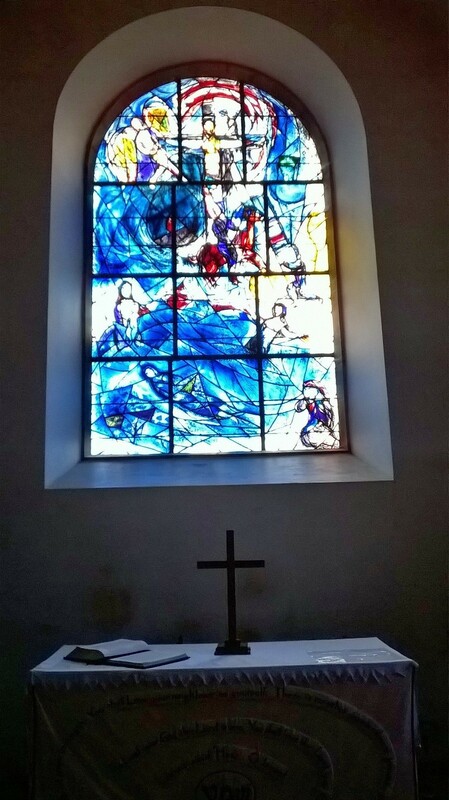 In a way it is similar to the ancient art of sculpture in Greece. For many years in the Archaic Greek Era the statues were stylised but during the Greek Classical Era the statues grew more accurate and precise to the human form. The Hellenistic Period saw the sculpture form reach its zenith with perfection and after that where do you go? The abstract. 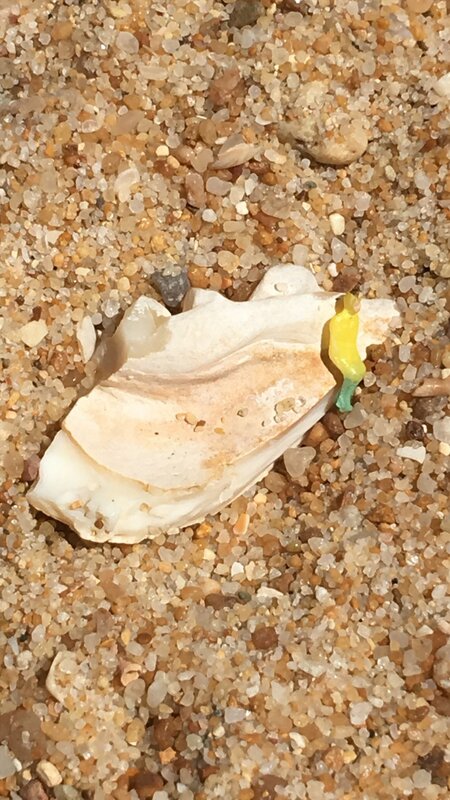 Maybe people are fighting the idea of perfection and creating beauty from the broken by taking code of an image file and editing tiny portions of the data to create errors in the image. I did this datablending with a few images I liked and the results are below. I am hoping to do this Glitch Art with my pupils very soon and will share my lesson plans and practise here. Manga is a Japanese art form and is a popular form of comics and animation. Many children may watch manga without knowing it such as Pokemon, Naruto, One Piece and Dragonball- these are all manga. 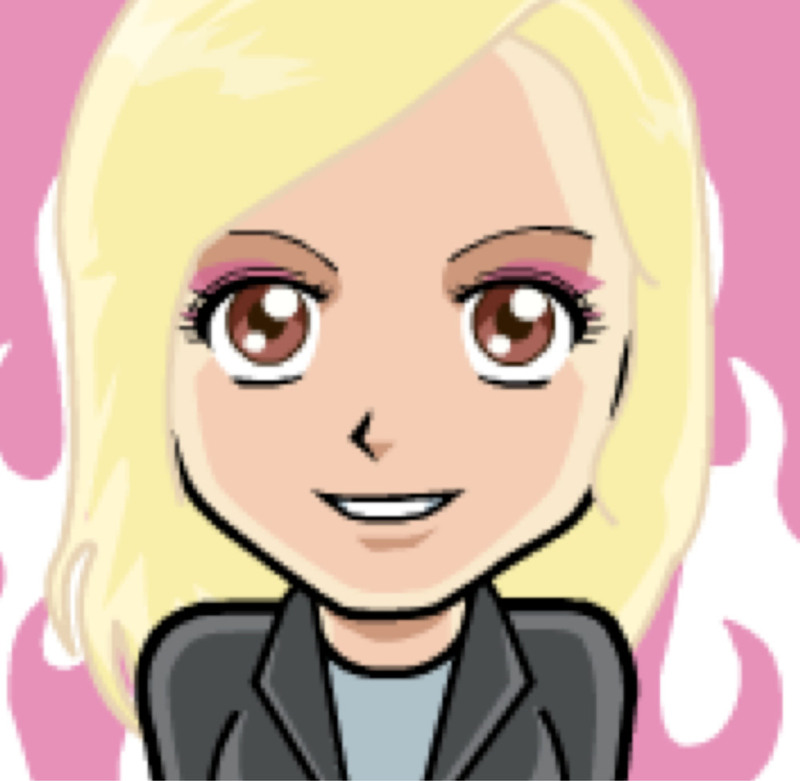 Manga is a distinctive art style which is usually characterised by big eyes, crazy hair and tiny mouths and noses. Working with a group of pupils from years 2, 3 and 4 we used faceyourmanga.com to create a mangatar, a manga style avatar of themselves. 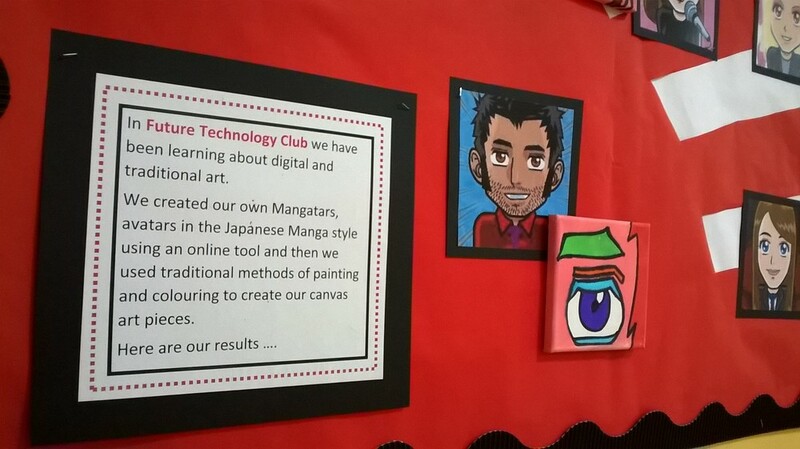 Once the children had created the mangatar we print screened the image and pasted it onto Word and enlarge it so that it fitted onto an A4 page. Once we had done that we used small canvases and the children traced around the eye of their character by using the projector as a guide. We then painted the image in bright colours to give it a comic/ Pop Art style. To finish off the work we went over the lines in a thick black pen and this made the art really stand out. We then worked very hard to put the display in place and these are the results. Why don’t you have some fun and make your own mangatar? But a word of advice... don't let your pupils use masks, gadgets or tattoos as they feature smoking and other inappropriate options. Otherwise have fun! We've just bought an OhBot at my school and are underway in using it to help teach programming. For the uninitiated the Ohbot is a robot head that uses a derivative of Scratch. Priced at just over 100 pounds (about $150) it really is a good investment to teach the children coding. The OhBot allows children to generate programs quickly and encourages them to experiment and use their imagination. The OhBot is flexible in that additional sensors can be used to allow for more complex coding. We have yet to fully get to grips with it but will be sharing our work here.